“The Les Mis story is like the most beautiful thing ever.” Agreed! “The other major strong point is the songs, obviously.” Agreed! “My love for it is smaller than my love for Les Mis as a whole.” We are on the same page. I adore the music so much and the story is so incredible that I feel it’s nearly impossible to make a truly terrible movie out of it. I gave the 1998 version 5/5 stars. I think you should try that one too. It also has a great cast. Yeah, I keep reading decent things about the 1998 film. I should probably give it a go at some point. Glad to hear we seem to be on the same page regarding Les Mis. Thanks for the recommendation! Aye, everyone has their own taste. I don’t understand why you would even go see it at all if you hate musicals so much, though. It’s not like I hate musicals – I just don’t watch them ;) But you know, I want to see all the Oscar nominated films, so what can I do? And if I don’t watch it, I can’t say it’s a bad or good movie. I don’t like people who don’t give a film a chance and just complain without having seen it. It’s just not my cup of tea, but every movie deserves a chance. I think I know exactly how you feel. It´s a great feeling AND a feeling of sorrow. A sorrow because you know that this is something that doesn´t happen very often and it´s a feeling you can´t share with that many people and it´s absolutley fantastic at the same time, experience moviemagic that gets to your heart like this. I hope Les Mis will stay there. Both in your heart and in mine. Thank you for the kind words, Fiffi! You’re pretty much right on the money there. It’s a bittersweet thing for sure. I don’t even know if it’s just movie magic as such, though. I love the movie of course, but it’s not JUST the movie either. It’s not this masterpiece cinematic achievement or anything (except for “I Dream a Dream”), but it has spawned something more… complicated. Ugh. I don´t think the story could have punched you in the face like that if you hadn´t experienced moviemagic. Something in the movie made you interested of learning more, listen more, see more. A heartbreaking story in an bad package is of course a heartbreaking story but still just a story. Les Mis is more than that. I´ve been thinking a lot about Valjean and his constant “turning the other cheek”. He wants to be the better man, doing the right thing. Did it do him any good? Okej, he never lost his selfrespect but otherwise, was it worth it? That’s a fair point, actually. Interesting. I feel like I need a lot of time before I can properly evaluate the movie as a movie, rather than as the thing it has become for me. I think Valjean’s actions certainly did him SOMETHING good. More than anything, it brought him peace of mind, and also many years of (we assume) pleasant living; first as a wealthy businessman and mayor, then as a loving foster father. Could he have had a better life had he made different choices? Striving for an honest life definitely saved him from a bitter ad angry life of crime, after the bishop helped him out with the candlesticks. Then it gets trickier. If not for his goodness, he never could have met Cosette, who filled his life with happiness and meaning. But he would also have remained mayor and wealthy businessman. 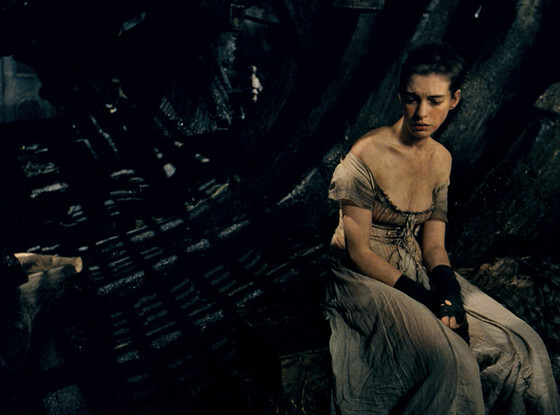 You could argue that he didn’t really do anything THAT wrong regarding Fantine; it was the foreman who fired her, and Valjean didn’t know what the situation was about. On the other hand, Valjean kind of kills Javert too by being so kind to him, which caused the inspector’s moral compass to explode from confusion. I’d chalk that up to Javert being too strict and rigid, though. Not Valjean’s fault. What I don’t really get about the ending is why Valjean treats the fact that he rescued Marius as a secret. Marius only found out about it due to Thénardier being a moron. Why couldn’t Valjean have told him himself? Was he just being humble, or was he for some reason ashamed about it? That’s something I didn’t quite get when I saw the movie. Wasn´t Valjean trying to hide from Javert when he helped Marius in the “avloppsrör”? If he had told Marius right away that he was the one saving him, he probably should have to say the whole truth to him and then Cosette would find out everything. I don’t think so, no. The whole reason for Valjean being at the barricades was to make sure Marius made it out alive. Marius was knocked out during the entire escape through the sewers, and as far as he knew, Valjean had already executed Javert back when Javert was a prisoner of the revolutionaries. Marius knew Valjean was fighting with them, so he would have no reason to be suspicious of him saving his life. If you can get a hold of the 10th Anniversary Concert DVD, it’s excellent. It’s a concert in costume, so it’s not quite the same as a live version, but the show is sung from beginning to end, and it has my very favorite cast of singers for the show (including a couple of Disney princesses, haha, with Lea Salonga as Eponine and Judy Kuhn as Cosette). I came down very hard on Russell Crowe in the movie because Javert is my favorite character, “Stars” is one of my favorite showtunes, and Philip Quast from the 10th Anniversary Concert cast does an absolutely incredible job with it. Is that 10th Anniversary DVD the same show as the Royal Albert Hall album? That album had an awesome “A Little Fall of Rain”, I recall. I’ll try to get my hands on a concert DVD at some point, I’m sure. Thanks for the recommendations! Despite listening to various versions by now, I’m still not all that fond of “Stars”. I worry that Crowe might have soured me on it forever. Time will tell. That’s the one. It was the cast album that first hooked me on the show. Oh, dear. If Crowe has ruined “Stars” for someone else who hasn’t had the opportunity to marvel in the beauty of the song, I’m pretty sure I’m NEVER going to forgive him. He and Gerard Butler will just have to live in Musical Theater Inferno forever. Heh. Gerard Butler has done nothing to endear himself to me as a movie actor. I don’t expect he’d be a very gifted singer.